The Winter issue of International Therapist is coming soon. 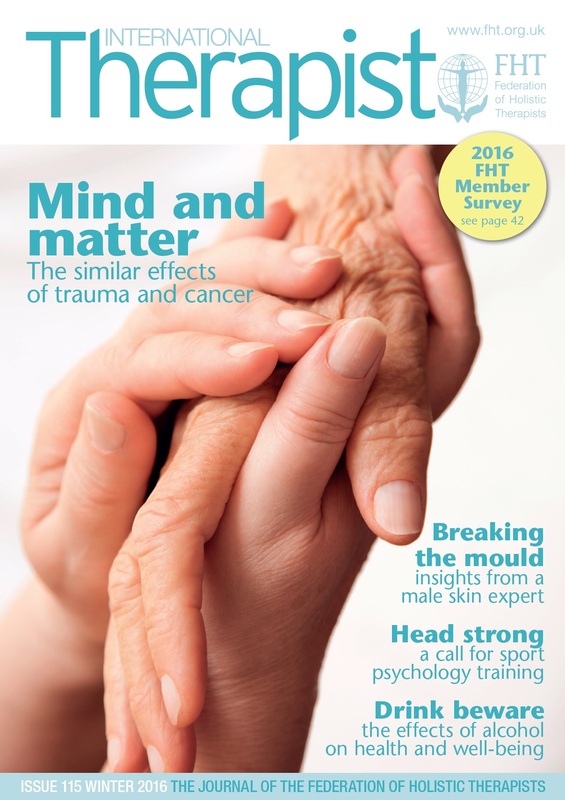 This issue includes articles by Patricia McDaniel, who reflects on working with clients affected by trauma and cancer; Robert Sylvester Coleman, who talks about working in the female dominated beauty industry and Dr Caroline Heaney, who discusses the importance of sport psychology education; plus a look at FHT award winners, Amanda Kirton and Sue Dobson, who provide therapy services for people with MND; the benefits of essential oils for horses; Dorn Haus; blogs; homeopathic remedies and Kim Ingleby highlights seven ways to enhance your business performance. Read an interview with FHT Excellence Award Winner Maria Mason and look out for our competition, where you can win a copy of The Concise Book of Trigger Points, by Simeon Niel-Asher. Don’t miss the opportunity to take part in the 2016 FHT Member Survey and be in with a chance of winning a £200 One4all Gift Card. Posted on 11 January, 2016 by Federation of Holistic Therapists (FHT). This entry was posted in news and tagged international therapist, news. Bookmark the permalink. I really enjoyed the article on the importance of Sports Psychology and also found the article “taking care of business” very motivating! Another great issue, Thankyou .